Don’t Miss Tech N9ne In Kansas City For The Zombie Pub Crawl! Get a chance to see Tech N9ne perform in his hometown of Kansas City at the Zombie Pub Crawl! On October 4, 2014, Kansas City becomes undead as the Zombie Pub Crawl kicks into full gear. Headlining the festivities is none other than Kansas City’s crown jewel Tech N9ne, as he will be performing at the Uptown Stage for what will be the craziest pub crawl this city has ever seen. Featuring 2 Live Crew, The Devil Wears Prada, Yes You Are and many more in a crawl that stretches across the city’s hottest bar districts, you cannot afford to miss this one-of-a-kind event. This show is an ALL AGES event, making it free to anybody that wants to see the best live show that hip hop has to offer. We love giving back to the people who support us. 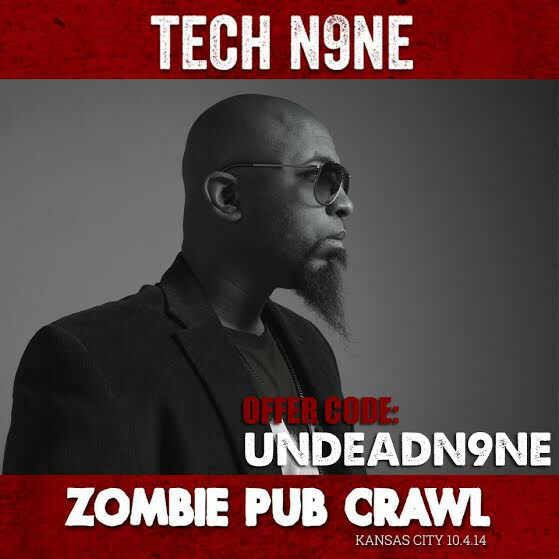 So we’re giving all Technicians the opportunity to catch Tech N9ne LIVE with a discounted ticket for fans under 21 to the Kansas City Zombie Pub Crawl! Rock out with the Kansas City King as he returns to his hometown and takes over the land of the undead! What’s your favorite thing about seeing Tech N9ne in his hometown?